What is Propylene Glycol Toxicity? The chemical compound propylene glycol is famous as the main component of antifreeze. Unknown to man, this has several uses and is even useful in the production of food. If a high level of this chemical is ingested, it can lead to symptoms of toxicity [1, 2]. 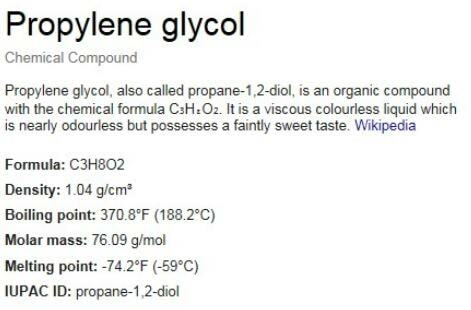 Aside from its use as an antifreeze, propylene glycol is used in the food and pharmaceutical industries. This chemical is used as an emulsifying agent and as an additive in several flavorings and seasonings. This compound is also widely used as a diluent for drugs such as lorazepam and Dilantin. It is a Food and Drug Administration (FDA) approved additive and is regarded as Generally Recognized as Safe (GRAS) in its use in the said industries. Although the safety of its use has been established, there are circumstances which may cause an acute propylene glycol toxicity [1, 2, 3, 4, 5]. How much is Propylene Glycol Toxicity? The world health organization has established the maximum amount of propylene glycol that can be ingested in a single day and this is 25mg/kg. The amount that can be taken intravenously has not been set. Individuals that are at risk for a propylene glycol toxicity are those who are receiving Ativan and diazepam intravenously. This is due to the amount of the chemical used to dilute these medications. Population groups that are at increased risk are the infants, neonates and the elderly. Other conditions that may increase the risk are kidney and liver insufficiency and burn patients who requires a long-term therapy of topical products that contains propylene glycol [1, 2, 3, 4, 5]. The main symptoms of overdosing on propylene glycol is the depression of the nervous system (CNS) and the patient may fall into a coma because of this. These patients may develop seizures and hypoglycemia. If the patient overdoses on propylene glycol due to the administration of Dilantin, they may also manifest disturbances in the conduction system of the heart, hypotension or decreased blood pressure and abnormal heart rate. Toxicity in children may cause hyperosmolarity, agitation, lactic acidosis, arrhythmias, hemolysis and seizures [1, 2, 3, 4, 5]. If the toxicity is caused by ingesting of food that have high levels of propylene glycol, the local poison control must be contacted immediately and they should be brought to the hospital immediately. Patients who had a toxicity due to the drugs that they are taking are diagnosed based on the symptoms that they present. The focus of the treatment is to manage the symptoms that have manifested. Sodium bicarbonate may be administered in order to minimize the metabolic acidosis that may have arose because of this. If stopping the medication will not be possible, intermittent hemodialysis may be performed to reduce the level of propylene glycol. This is the method of choice because of its ability to rapidly reduce the amount of propylene glycol in the system and correct metabolic abnormalities at the same time [1, 2, 3, 4, 5]. Consuming propylene glycol within the recommended level of the World Health Organization is the best way to prevent the toxicity. Those who are undergoing therapy with medications that uses this chemical as its diluent must be monitored for the signs and symptoms of the toxicity, especially those who are in the at-risk population group, in order to prevent the development of any complications [1, 2, 3, 4, 5]. Wlson, K. C., C, R., C, T. A., & Farber, H. W. (2005). Propylene glycol toxicity: a severe iatrogenic illness in ICU patients receiving IV benzodiazepines: a case series and prospective, observational pilot study. Chest, 1674-1681. Zar, T., C, G., & A, P. M. (2007). Recognition, treatment, and prevention of propylene glycol toxicity. Seminars in Dialysis, 217-219. Lim, T. Y., Poole, R. L., & Pageler, N. M. (2014). Propylene Glycol Toxicity in Children. The Journal of Pediatric Pharmacology and Therapeutics, 277-282.